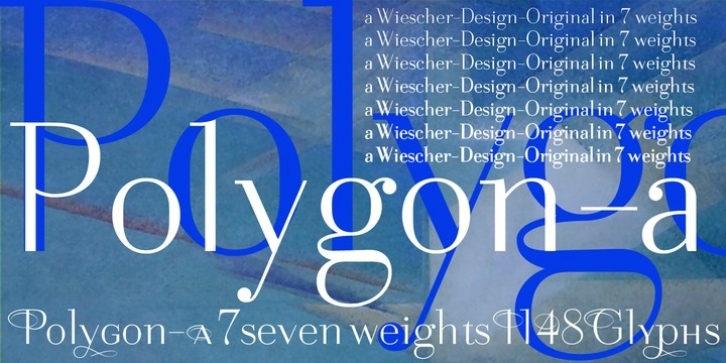 Polygon are unique fonts with a modern character based on the rational thinking of the enlightenment with its classic forms and timeless elegance. This first installment will be followed by more extreme and by less extreme designs on the same design basics. You get many embellished characters in each font. The font has over 1100 glyphs, but you need to have Open-Type-Savy software to use the font to its full extend. These fonts have been designed to work great as bodycopy, the heavier weights are meant to be used for smaller sized typesetting and the lighter ones should be used when the sizes get bigger. Enjoy!